We spend a lot of time on the roads during the warmer months. And work zones are a familiar site. Work zones are dangerous for workers and drivers. According to the Bureau of Labor Statistics, transportation incidents and workers struck by vehicles or mobile equipment account for the highest number of fatal work injuries. It’s imperative to practice safe practices in these zones, whether you’re working in them or driving through them. When preparing a work zone, OSHA requires a traffic control plan be in place for moving vehicles in areas where men and women are working. Drivers, workers on foot, and pedestrians must be able to see and understand the routes they need to follow. This can be accomplished with the use of traffic control devices, including signals and message boards. These devices will direct drivers away from the work site. Standard highway signs provide a variety of information for drivers, including alerting drivers of the existence of a work zone, speed limits, and designated traffic paths. 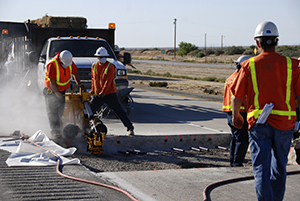 Various styles of protective devices should be used to protect the work zone. Concrete, water, sand, collapsible barriers, crash cushions, and truck-mounted attenuators will help limit motorists coming into the work zone. Flaggers and other workers providing temporary traffic control should wear high-vis clothing with a background of fluorescent orange-red or yellow-green, and orange, yellow, white, silver, or yellow-green retro-reflective material. This clothing makes workers more visible to oncoming traffic. There are also safety practices that should be followed as you drive through a work zone. Be aware – Normal speed limits may be reduced, traffic lanes may be changed, and there may be people working near the road.